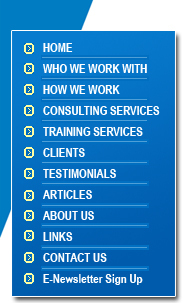 Teleconcepts provides visitors to the web site with a wide variety of books, PDFs e-zines, resource links, and articles. All the material provided is designed to help you maximize your tele-sales program. Add On Selling shows you how to take any customer or prospect contact and professionally squeeze, extract and wring every ounce of potential from it. Great skills training book filled with no nonsense tele-sales tips and techniques. Fun and easy to read. Click below for a free sample of the various chapters. To buy the book click on thumbnail on the righthand side! Every single week I get at least one or two sales managers asking me about motivating their sales reps. Inevitably, they are looking for a contest, an activity or event that will help stimulate up sales by pumping up their reps. I refer everyone of them to my buddy Dave Worman. Dave has taken all the mystery out of motivation with “Motivating With Sales Contests.” Unquestionably, this is the #1, ‘how to motivate’ book in the marketplace. Dave has collected every conceivable contest under the tele-sales sun and put them together in one, easy to use book. There are 200+ proven ideas on how to shake the cobwebs from your reps and crank up sales. And he tells you everything you need to know to get the contest up and running: goals, objectives, materials needed, how to set it up. You name it. This is the one and only motivation book you will ever need. So, stop wasting your time trying to re-invent the ‘motivation’ wheel. Get Dave’s book, get your sales reps pumped up and watch sales soar! 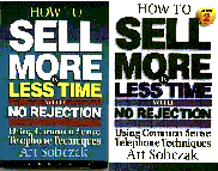 When you think of tele-sales skills and techniques, you must think of Art Sobczak. He is a good friend, a great mentor, a super golfer, my publisher, one heck of a trainer, and an undisputed expert in business to business tele-sales. Art’s books and tapes belong on everyone’s shelf and if you are serious about succeeding in sales then you MUST add his books to your collection. Every tip is solid gold. There is no other way to put it. They good, practical, no nonsense techniques. Quite honestly, I have “borrowed” some of them myself; they are that good. On the other hand, Art and I approach some situations quite differently. I don’t mind saying that. There are many good ways to sell. And that’s why this book is invaluable to you. Art gives you another perspective, another angle and approach. He broadens your skills and his ideas will make you that must sharper. Check these books out. You won’t be disappointed! Guaranteed!